Discussion in 'Standup Technique' started by rupy, Mar 20, 2008. I need a boxing timer, what is the best option? Buy one, or do a make-shift one? What will you be using it for? Strictly boxing rounds or other workouts as well? Also, are you gonna be using the same amount of time each time you work out or are you gonna be varying things a lot? If you're gonna be doing really simple workouts, like say 3 minute rounds 1 minute rest all the time, I would make on myself with an mp3 player. I actually have that cheapy yellow Everlast timer, and it's ok, not very loud tho, so you either have to have it on you with the vibrate, which is ok, or sitting somewhere fairly close. Not bad for the price. Whenever I'm training on my own, I just use an electronic kitchen timer. You should be able to find one in the supermarket for a few dollars. That's all you need. It's digital and you can set it to beep in 3 minutes just like a round. Watch the clock for 1 minute and then start it again. Until you buy a real one here is a 12-round timer in Mp3 format. 3 minute rounds, 1 minute rest, with alot of warnings/countdowns etc. in between. it really helped me through my broke times. and if you wan't even more interactivity, go buy the bas rutten CDs, or shoot me a PM. I have this in my garage. But then again it depends on if you are seriously training or not. I also use an mp3. I have one in 2 min 1 rest and 3 min 1 rest. It works good for me. I would say buy one they are useful and you can find a lot of applications for them besides straight sparring. I bought the Gymboss two weeks ago, and it works really well. It gives you a different perspective on time (one minute is a long time when you are waiting for the beep). It may be a little quiet, but I usually clip it to my shirt and set it to vibrate and beep. Great little timer. I actually got mine on EBay. i had a gymboss.... it was good but too fragile. it broke after a little bit. Academy has a 10 dollar one. I use this when I do bag work in the basement. Dkickboxer has a great one but if you want you can get a small one at most sporting goods stores for aboiut $12. It will work great if you are working out by yourself in your garage and on a budget. If money is not a problem then the one Dkickboxer has is a great one. but i can set this to do pretty much everything i need to do. I got mine at Sports Chalet...Everlast Personal Boxing Timer. I bought it for $14 total. Awesome deal! can be adjusted for either 2 or 3 minutes and from 1 to 12 rounds with 30 to 60 second rest periods in between rounds. Built in vibration and ring gong features alert you of the end of each round. 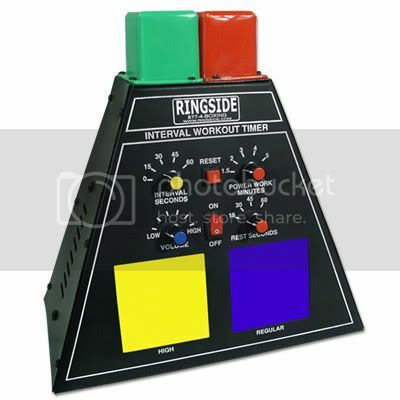 Ideal for workouts using heavy bags, speed bags, jump ropes, double-end bags, or other types of interval training at the gym or home. Requires 2 AAA batteries which are included.